Can Europe find a way out of the crisis and start growing again? Can it still be a decisive actor in the global economy? According to Antonio Tajani, Vice President of the European Commission in charge of Industry and Entrepreneurship, this is still possible. But to be successful again, Europe has to go back to producing: it has to give industry “the centrality in the economy it deserves”, focusing on innovation and on the development of a new strong entrepreneurial spirit. 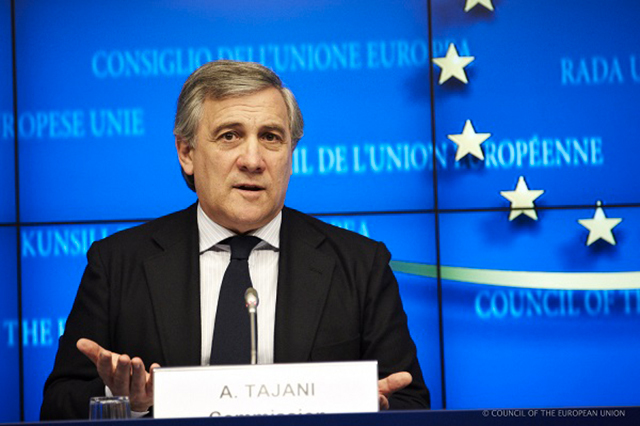 Vice President Tajani has accepted to discuss these topics in depth with UNITEE on the 2nd May, allowing us an extensive interview on the challenges facing Europe today and on the steps the Commission is taking to face them. 1. Vice President, the economic crisis, five years after it began, is still hitting our economy: is it possible for Europe to overcome the crisis and return to growth, or should we learn to live with a poorer and weaker Europe? There is still space for growth in Europe, and the key to it is the European industry itself. My main goal is to revamp sustainable growth and employment in Europe by focusing on the promotion and support of our industrial basis. We have to understand that there is no future for European economy outside industry. To do so, Europe must invert its industry’s tendency to decline. Our “New Strategy on the industrial policy” adopted in October 2012 aims exactly at that: before 2020 we want to increase the contribution of industry to the total European GDP from the 16% to the 20%. In these perspective, it will be fundamental to concentrate investments and innovation on the six lines of actions at the center of our industrial policy: advanced production technologies, bioproducts, sustainable buildings, sustainable raw materials, clean transports and intelligent networks. 2. Could you please mention some specific steps that the Commission has taken to foster an “industrial reawakening” for Europe? First of all, the reduction of bureaucracy is one of the top priorities of the European policy towards SMEs. This point has been stressed in the important Small Business Act (SBA) adopted by the Commission in February 2011. Another goal of our industrial policy is to improve the internal market for goods, that consists alone of 75% of all within-EU trade. For this reason we have set ourselves the goal of developing the amount of the exchange of goods in the internal market to constitute the 25 % of GDP before 2020. We’re also working to tear down the barriers to the market of services, which constitute an issue more and more central, since the line separating goods and services is ever less definite. Services to enterprises, in particular, are crucial for industrial competitiveness and innovation and are of special importance for SMEs, who, more than their bigger counterparts, resort to the purchase of services on the market. 3. If many SMEs have already been successful at internationalization, the majority still struggles: 65% of international trade happens within the EU. What are the Commission’s projects to help European SMEs in the process of internationalization? The European Commission is already highly engaged in helping the internationalization of SMEs. In particular, Enterprise Europe Network carries out an important role in keeping enterprises constantly informed on issues concerning the EU, vital for their daily activities. Furthermore, it helps them find international partners and offering them other high-value, personalized services. As far as the access to finance is concerned, COSME, our new project for the SMEs’ competitiveness with a budget of 2,5 billion € for the period 2014-2020, includes a specific chapter concerning the support to SMEs for internationalization. Last but not least, the European Commission is reinforcing bilateral relations with third countries, at the same time helps European SMEs, in our “Missions for Growth”. I’ve been organizing these missions since 2011. Usually, in this missions I travel with groups of around 50 enterprises, and we organize political high-level discussions and business-to-business meetings. 4. European economy, if it wants to become a “knowledge-based economy”, has an enormous need for educated and innovative individuals to be able to compete in the world. How can Europe attract talented people from other countries, and integrate them in a way that they can contribute at best to its economic growth? Moving to Europe for a short period of study and research is an opportunity that is currently being seized by more than 200.000 young people from outside Europe every year. However, too many find themselves limited by a series of factors: long and complex visa procedures, different rules for each country hinder the EU’s ability to recruit talents and reduce its appeal as a world center for excellence. Last March the Commission has made the proposal of making it simpler for students, researchers and other non-EU citizens to sojourn in Europe for periods superior to three months. The new legislation will establish clearer time limits for the authorities to accept or repel permit requests, will give major opportunities to enter the job market while in Europe and will facilitate inter-EU circulation.